Recent college graduates are the new generation. So their mind works little different than the experienced candidates. They have new skills, new ideas; In short, they are the updated versions. 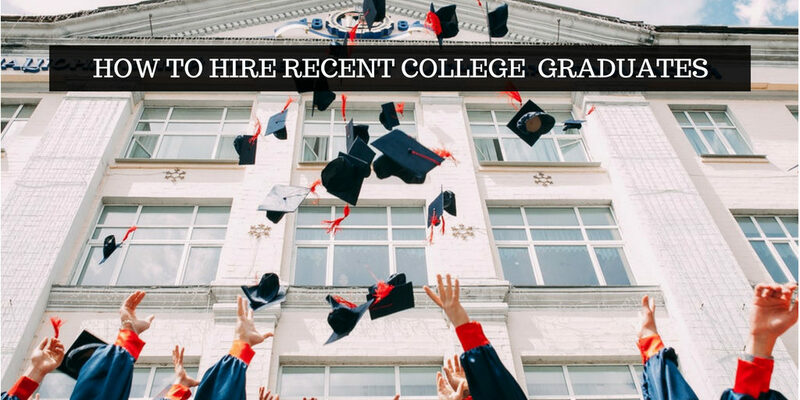 Check out following tips for hiring recently graduated candidates for your company. Many colleges and universities organize career fair for their new graduates. Career fairs are great places to seek for new talents. You will find a huge variety of choices there. Instead of waiting for new graduates to come to you, you can choose the best among them. So get connected with the universities and find new talented employees for your firm. 2 – You can use social media to find Recent College Graduates. Nowadays social media is the must for every age group and especially for youngsters. It is like essential for the life. After graduation, they are looking for a job and if they find a vacancy on social media, they will get interested. You can use your company’s social media profiles to post new job vacancies. Make your job posting detailed, you can put photos of the office environment to attract new candidates. 3 – Always highlight company’s benefits in your job postings. While you prepare job posting, highlight the benefits of the job and company. Think like a recent graduate and try to imagine that what kind of benefits and facilities can attract you. Highlight all types of facilities you are providing. It can be anything, like coffee, lunch, festival celebrations etc. Try to highlight even the smallest facilities you provide. 4 – Make your interview process comfortable. The most important part is that how you conduct the interview. It is obvious that new graduates are not familiar with the professional interviews. So it’s not good to ask them the same kind of questions you might ask experienced candidates. Ask them about their hobbies, achievements in college, internship etc. Slightly modify your interview techniques for the new graduates to make them comfortable. Finding recently graduates or freshers is not hard but hiring them is little tricky. You can make few changes to your standard hiring process. This will help you to attract good freshers candidates. Do share your hiring methods with us in the comments section.